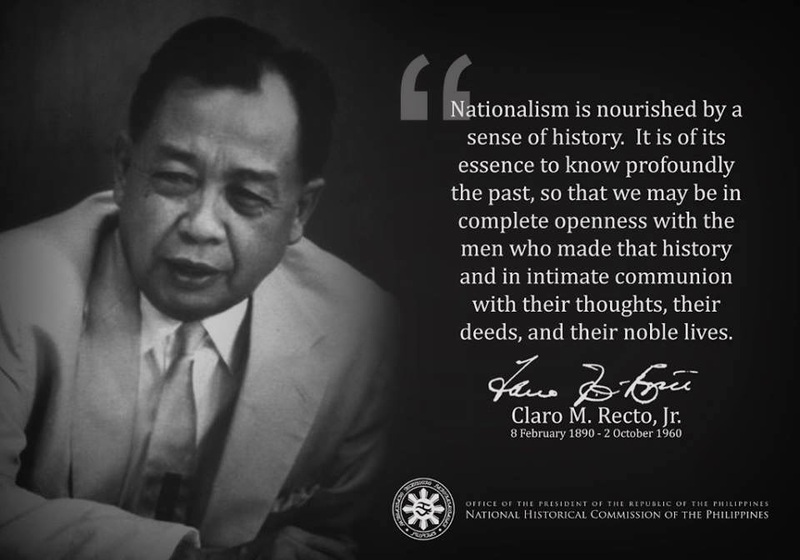 WHAT WE FILIPINOS SHOULD KNOW: In the history of nation-states, almost each nation has gained national identity, unification and sovereignty through battles and wars against a foreign enemy. Our Filipino forefathers rose against the Spaniards, our 400-year foreign occupiers. However, their revolution was hijacked by the cunning and better armed Americans whom they also fought but failed to defeat. The Americans left us natives with their local substitutes: mis-educated (Americanized) fellow Filipinos, who knowingly or unknowingly, govern, think and work for American economic and military interests, i.e. economic globalization/transnational corporations via WTO and VFA, JUSMAG, etc. respectively. We should not forget who the US foreign policy-makers do and will support whenever political upheaval seems to blow up in our homeland. (since America has always freely thrown its weight around). America's foreign policy planners prepare and coolly act to place their bets on the surely, Americanized minds among native politicians, businessmen, technocrats, and military officers. We do not think or unknown to most of us -but to be expected- that America always has identified and will support Filipino leaders whose Americanized minds will continue to protect American "national" interests, i.e. economic and military interests; and those of other foreigners, i.e. Chinese, Japanese, etc.) in our homeland. These so-called Filipino leaders, by their conditioning and/or selfish reasons, readily coopt and sacrifice the common good and our national patrimony; and thus should also all be seen as traitors/quislings to the Filipino people of present and future generations. We should remind ourselves that America is vehemently against Third World nationalism. In our case, it is against Filipino nationalists whom it sees as threats to American so-called national interests (which are ever-enlarging beyond America's borders). Since the mid-19th century, the presence of American businesses in foreign lands has evolved into an excuse for foreign interventions, landgrabs and occupations, sanctions, preemptive strikes or regime change, overt or covert. The USA of today will act to bring down or destroy nationalistic governments which fight for their own national interests (oftentimes at this point in history opposite those of American business and/or military interests or American hegemony). America is against such Third World governments, as any serious and critical study of past, recent and current world history will demonstrate, i.e. Chile, Nicaragua, El Salvador, Iran, Cuba, Venezuela, Bolivia, etc..
America is not necessarily against communists, who it has learned to do great business despite its official proclamations for human rights, etc., as with the mainland "Communist" Chinese or Vietnamese. The America of today is not anymore the America we read about in our school textbooks. America today is controlled by and run by "corporate America" and therefore America's main priority today is business, the business of maximized profits for its multinationals or transnational corporations devoid of governmental hindrances. Even Thomas Jefferson, one of America's greatest founders, foresaw such. In America's pursuit of profits while paying lip service to its now neglected humane ideals, it finds -as it does in other countries it greatly influences- our native comprador intellectuals a welcome bunch of mercenaries. Below is an article about such fellow Filipinos, these "comprador intellectuals," bvy the late Prof. Renato Constantino. Neocolonialism - The dominance of strong nations over weak nations, not by direct political control (as in traditional colonialism), but by economic and cultural influences. In the relations between South and North, there occurs year in and year out a one-way transfer of wealth from the former to the latter. However, this fact is hardly noticed by the majority of the peoples of the South. On the contrary, because of the pervasive process of westernization of their patterns of thought, they believe themselves to be the recipients of aid and charity. In this process, the intellectuals of the South play an important role. When the Western powers tried to penetrate imperial China which looked down on them as "barbarians," they dealt with a group of native merchants who distributed foreign goods from western ships and brought local products to these vessels. A merchant engaged in this type of operation was called a comprador. While compradors still exist in the economic sphere, we can broaden the scope of the term to apply also to intellectuals who perform the function of purveying among their countrymen those western modes of thought that facilitate the transfer of wealth to the North. We may call them comprador intellectuals. In our country, almost everything is up for sale, and almost everyone who wants a fast buck is into buying and selling. The rules of the marketplace apply not only to goods but also to people and principles. Prostitutes peddle their bodies to GIs, tourists and philandering natives. Migrants exchange brawns, brain and loneliness for dollar earnings. Artists pawn their souls to commercial concerns to sustain their art. Government leaders put a price tag on sovereignty to secure aid and, they hope, economic recovery. But the comprador intellectuals are perhaps the worst of the vending lot. They are well-deployed, have wormed their way into the highest echelons of the state, the most prestigious universities, the most successful business firms. They have invaded the media and thereby exercise influence over public opinion. They fashion the latest orthodoxies with state of the art phrases and deft strokes on the computer board. They shape the Filipino's world view, making sure it fits snugly into the framework of the "free market" and the "free world." How did these comprador intellectuals emerge as a distinct social stratum? Why did they wind up selling their brain power and justifying this transaction as virtually the natural order of things? Miseducation is one answer. Schools, like factories,churn out products who will fit like cogs in the neocolonial machine. Highly commercialized training culminates in the receipt of a diploma which qualifies the ambitious to pursue highly lucrative careers. Most families sees education as an investment, for which handsome returns could be claimed ffrom successful offsprings. Thus, there is often a rush to earn more than a respectable sum and to acquire a sufficiently prominent social status among graduates who endeavor to shine as comprador intellectuals in government, academe and information structures. Such intellectuals are in perpetual search of grants and sholarships to further hone their vending talents. Thus, we have the spectacle of scholars during commissioned researches for foreign funding agencies to satisfy not only their egos but also their dollar hunger. Valuable information often passes into alien hands, with the ironic result that foreign outfits may know more about ourselves. It may also happen that Filipino effort goes unheralded and unacknowledged in the books and orther works produced by overrated foreign "Filipinologists" or even correspondents who fly in and out of hot spots like the Philippines because Filipino comprador intellectuals price themselves so cheaply that foreigners can derive fame and recognition at their expense. The comprador intellectuals as highly westernized creatures perform rather well in spreading notions that reinforce the exceedingly beseiged status quo. They provide defenses for the indefensible --our huge foreign debt, privatization, deregulation, import liberalization, ets.-- thereby giving aid to the forces who have reduced our economy to a state of terminal distress. They seek to discredit all alternatives to the neocolonial model of development. Comprador intellectuals are like cosmetologists who prettify the grim face of neocolonial reality. They parade their expertise before all and sundry, and hope that the highest bidders are in the audience somewhere. Sometimes, they are akin to undertakers who must dress up a cadaver to stimulate life. They respect the truth only if the truth will sell; otherwise, they would rather lie and try to get away with it. In other words, comprador intellectuals are in essence prostitutes who specialize selling mental rather than physical labor. Most prostitutes can claim a higher place in the moral order, since they at least have their poverty to justify the sale of their bodies.